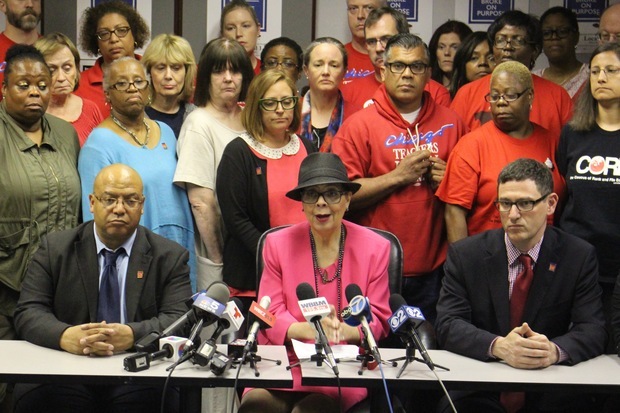 Chicago Teachers Union President Karen Lewis (center) and Vice President Jesse Shakey (right) hammered out a tentative deal with CPS officials Monday. CHICAGO — Eight months ago, the leadership of the Chicago Teachers Union was prepared to accept a new contract that would have forced all teachers to pay more for their pensions and health care insurance and would do nothing to reverse hundreds of millions of dollars in cuts to classrooms. But that deal — touted by Chicago Public Schools officials as a fair sacrifice — was rejected out of hand by the union as unacceptable, a decision that would bring the city to the brink of a teachers strike that was averted at the last minute. "There's no doubt that it was a gamble," Chicago Teachers Union Vice President Jesse Sharkey said. "Our people, our members accepted that risk. It was a fraught period of time." A comparison by DNAinfo of the tentative agreement inked Monday and the agreement rejected Feb. 1 found the union won significantly more resources for classrooms across the city while maintaining — and in some cases expanding — lucrative perks for teachers and support staff members by forcing CPS to renegotiate the pact while threatening to strike. In total, the deal means about $300 million more for schools, including compensation for teachers and programs for students, Sharkey said. "There is no doubt we achieved concrete victories," Sharkey said. "But it is not the best contract ever." The tentative agreement will be reviewed by the union's House of Delegates Wednesday, and then submitted to the union's rank-and-file membership, including nearly 30,000 teachers and support staff members for ratification. CPS spokeswoman Emily Bittner said the deal was "fair to both sides." "For the district, not only does this deal provide teachers with a raise and secure their pensions, it also achieves meaningful savings that helps stabilize our finances," Bittner said. Overall, CPS said the tentative agreement, once implemented, "will save $300 million over the life of the contract." CPS officials did not provide an accounting for that figure, declining to provide more information until the pact was approved by union members. The eight-month deadlock over a new deal ended once Emanuel agreed to heed months of calls from union officials, aldermen and parent-led group Raise Your Hand to give schools millions of dollars that had been collected by the city to spur the redevelopment of blighted areas. "He essentially said 'yes' to our biggest demand: to use money" from the tax increment financing districts, Sharkey said. "People had to decide whether to take 'yes' for an answer." About $88 million will be transferred to CPS to help cover the cost of the contract, officials said. Emanuel has long resisted using TIF funds to bolster the CPS budget, saying that it was inappropriate to use money from a one-time revenue source to pay for school operations. In fact, Emanuel criticized Cook County Board Commissioner Jesus "Chuy" Garcia during the 2015 mayoral campaign for backing the teachers union's call to use TIF funds to prevent a round of budget cuts. In an interview with the Tribune's editorial board, Emanuel said this agreement would put the Chicago Public Schools on a "better sustainable path than every contract preceding." Perhaps just as big a win for the teachers union was CPS' decision to continue paying the bulk of pension contributions for current teachers, who put 2 percent of their salaries into their own pensions, while CPS pays 7.4 percent. CPS agreed to pay part of teachers' pension contribution in 1987 in place of a pay raise as part of contract negotiations. That "pension pickup" cost CPS $170 million during the 2015-16 school year, officials said. New employees will be required to contribute 9.4 percent of their yearly salaries to their retirement accounts. In return, teachers hired after Jan. 1 will get two raises of 3.5 percent — one effective in January and the other effective in July. There was a good deal of debate on the union bargaining team about whether to accept a two-tier pension system, Sharkey said. "It can create division," Sharkey said, but he added that those concerns were assuaged with the bumps in base salary for new teachers. In the spring, Claypool announced he would unilaterally stop the pension payments, known as the "pension pickup," prompting union officials to immediately threaten to walk off the job. Later, Claypool agreed to discuss the issue as part of contract negotiations before taking any action. Both the offer that was rejected in February and the tentative agreement signed this week maintained raises based on teachers' experience and education. CPS initially proposed eliminating that structure entirely, prompting outrage from the union. "Those are really are bread-and-butter issues," Sharkey said, referring to the pension pickup and so-called step and lane raises. CPS teachers with more advanced degrees get higher starting pay and are placed in different "lanes." All teachers are on the same "step" schedule, which provides increases in base salary each year for teachers for up to 16 years. Those raises were frozen during the 2015-16 school year, when teachers worked without a contract, and will not be restored retroactively. But they will be implemented during the agreement's final three years. The union gave ground on the issue of cost-of-living raises for employees to reach the tentative agreement. The rejected offer proposed raises for teachers and support staff members totaling 8.75 percent over the four-year term. Instead, they will get 4.5 percent over the four years, starting in 2018, with no pay raises during the 2015-16 and 2016-17 school years. CPS officials expect health care costs to rise 6 percent a year, and had asked union members to pay 1.5 percent more of their salaries during the term of the contract toward their coverage in the rejected offer. Instead, union members will pay 0.8 percent more for health care coverage, according to the tentative agreement. Both sides also agreed to what CPS officials called "significant plan changes" that will "substantially" reduce CPS costs. If both sides can agree on "alternative savings mechanisms," the increase could be rolled back entirely, according to the tentative agreement. The rejected offer would have prohibited teachers from being laid off for economic reasons, a major concern for the union after nearly 500 teachers were pink-slipped because of budget cuts in August. But the tentative agreement revised that provision to allow laid-off teachers to earn their full salary for essentially an entire school year while waiting for a permanent position to open up. Another major flash point between the union and CPS was the use of evaluations to penalize teachers considered substandard. That system has been modified to be more fair and ensure that good teachers don't have to live with the "constant fear" of being fired, Sharkey said. "The old system was insane," Sharkey said. Teacher evaluations were also at issue during the 2012 strike, which lasted seven days. "We were unable to achieve these changes last time," Sharkey said. The tentative agreement also establishes more preparation time for teachers during the school day, and changes the system's grading policies. Both the rejected offer and the tentative agreement include a provision to cap the number of charter schools at 127 campuses — another major issue in the 2012 strike. The agreement also prohibits the closure of any underenrolled school during the term of the contract. The tentative agreement also includes the first enforceable limit on the size of classes in 20 years, Sharkey said. CPS officials agreed to earmark $7 million to hire teachers' assistants in kindergarten through second grade classes with more than 32 students, starting in January. The provision is one of a number of "historic breakthroughs" designed to address teachers’ quality-of-life concerns, CPS officials said. But Sharkey said the union's biggest loss in negotiations was to put limit on the number of students assigned to CPS social workers. Right now, that ratio is five times the recommended limit set by the National Association of Social Workers. "That was one of the last things to be dropped," Sharkey said of a push to expand services at schools to include health care and violence suppression efforts, often called "wraparound services." "Those things cost a lot of money." But the agreement removes case management duties from counselors, clinicians and special education teachers in an effort to free them up to "focus on meeting students' needs," CPS officials said. The agreement also earmarks $10 million to $27 million to provide after-school programs, counseling, social work and psychiatric services and medical clinics at 20-55 schools to be picked by a joint committee of union members and CPS officials. "That is a real investment in neighborhoods," Sharkey said. The $5.4 billion Chicago Public Schools budget, adopted in August, assumed officials would reach an agreement with the teachers' union that saved $31 million. It is unclear how CPS will make up the difference, even with the infusion of cash from the TIF districts. Laurence Msall, president of the Civic Federation, a business-oriented government watchdog, said he had a number of questions about the agreement, including how an early retirement incentive plan would work. For it to be implemented, at least 1,500 teachers must agree to retire early at the end of this school year in return for an extra $1,500 per year of service to the district. Members of the support staff with 10 years of service will get an extra $750 per year of service if they retire at the end of the year. In addition, Msall said he was concerned that the school district's budget relies on $215 million that the General Assembly and Gov. Bruce Rauner promised to give CPS in return for "pension reform." That uncertainty has not been acknowledged by CPS officials, Msall said. "I'm pleased a strike was averted, but the school district needs a long-term plan," Msall said. Sharkey agreed, saying the fight would now shift to Springfield as Chicago officials ask state lawmakers to change the system to ensure "equitable" funding for districts like Chicago, which have a high number of students whose families are considered to be below the poverty line.